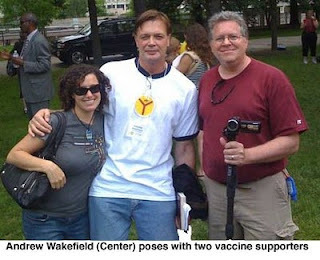 While between 50 to 100 people attended an anti-vaccination rally and Andrew Wakefield speech in Chicago, one sponsor wasn’t disappointed. The CEO of the Placebo Consortium, who identified himself Mr. Green, said he was moved to tears. The Placebo Consortium, according to various sources, is a secret organization dedicated to promoting complementary and alternative medicine. Supporters say that they just want to secure profits for CAM businesses. Critics say the group wants to endanger the health of humanity to enrich themselves. Green claims he used to work for the pharmaceutical companies, before he saw the light. According to Green, he found his real calling in the consortium. Green says that vaccines do work, but they’re bad for business. He added that thanks to Wakefield and Jenny McCarthy, the Placebo Consortium expects to generate record profits for years. The group Women Thinking Free staged a counter-protest. No arrests were made, but one member said she felt sick after Wakefield touched her. Men Asserting Their Thoughts sent out press releases protesting the event. Green said he wasn’t worried about the protesters. Green then walked over to a woman wearing a wig, sunglasses and an overcoat. He handed a check to her. The woman pulled a finger out of her nose. The $5 challenge goes to TAM!